The bad one is comforting, false, deceptive, and in some cases deeply desired. It says things some people find easy to believe. In 2016 in the United States, bad anachronism wears red baseball caps and threatens people. The good one is disorienting, challenging, true, difficult, and hard to encompass. It reminds us of things some of us would rather ignore. This attitude toward history and society is on the run just now, but it’ll be back. We need to keep creating it. The arc of history bends into complexity. I’ve been thinking about bifurcated anachronisms since the summer, when I read Peter Adkins’s perceptive essay “Anthropocene Flotsam”, as part of this Ecocriticism Now thread. Writing in response to my latest book Shipwreck Modernity, Adkins contextualizes my project through Derrida’s blunt but useful distinction between “good” and “bad” anachronism, as described in The Beast and the Sovereign, Vol. 2. The deconstructionist maxim at which the philosopher arrives seems both predictable and convincing: “every reading is […] anachronistic.” But, as Adkins emphasizes, distinguishing between the productive juxtapositions of historicist scholarship and nostalgic blindness isn’t always simple or straightforward. Subtle slips lurk between the good and the bad. 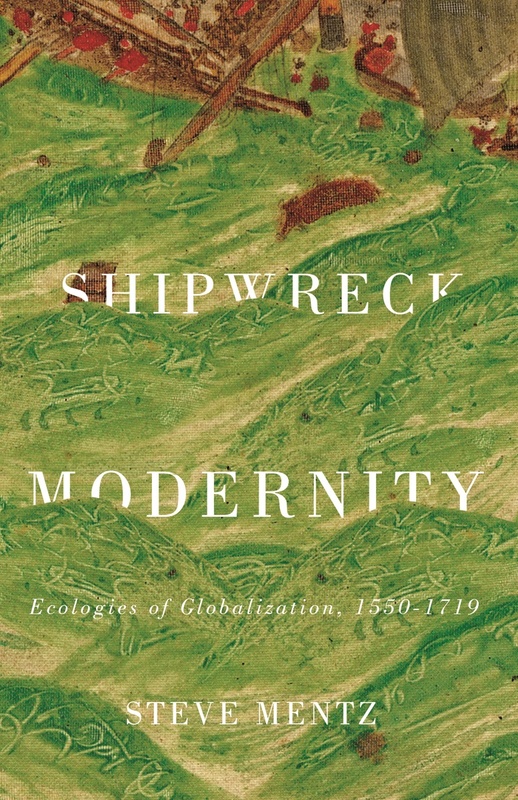 Adkins rightly suggests that the eco-theoretical ecstasies in which I indulged in the final pages of my book, under the subhead “Seven Shipwrecked Ecological Truths,” sit uncomfortably alongside reports of death by drowning among twenty-first century shipwrecked migrants in the eastern Mediterranean. The twinned disciplines of anachronism and historicism require a further turn away from premodern-inflected theory into our catastrophic present, its injustices and especially its suffering. Thinking about humans and the humanities in an age whose allegiance to the brutal nostalgia of bad anachronism grows ever more overt, I want to model ways to distinguish between good and bad approaches. Scholarship needs more of the good anachronism and ways to fight back against the bad. Writers and critics need anachronism to do engaged intellectual work. The fortress of historical accuracy cannot protect humanist or post-humanist ideals. Historicist ecocritics especially need to anachronize positively – to use good and messy anachronisms to challenge bad and comforting nostalgia. All the most valuable concepts in the environmental humanities flirt with anachronistic error, because they speak to at least two times at once. Anthropocene thinking uses a new geophysical designation to reframe received narratives about the relationship between humans and the non-human environment. Such thinking dances up close to anachronism, looks deeply into its variably chronic eyes. What would it mean for anachronism to say yes to history? Or for historical scholarship to say yes to anachrony? What polychronic monsters are even now slouching toward turgid oceans to be reborn? In premodern cultural scholarship today, anachronism can serve as a cudgel with which to beat other scholars. When I was a grad student in early modern literature in the 1990s, anachronism seemed the unforgivable error, the thing that would pull back the curtain and reveal me as scholarly imposter. A perceptive In the Middle blog post by Michael Johnston and Alex Mueller has recently suggested that accusations of anachronism disfigure many hostile books reviews in medieval studies. I’m not very happy to report that the same policing appears in Renaissance Quarterly and other early modernist venues. I value the old and obscure as much as most premodern scholars, and I would never want to forgo the mysteries and pleasures of the archive – but we need a better language to define productive anachronism in our disciplines. “The bug you would fright me with, I seek,” says distraught Hermione on trial in The Winter’s Tale (3.2). What if anachronism isn’t a threatening step into the non-scholarly abyss but an active challenge? What does anachronism want? What would anachronism do? (WWAD?) Premodern scholars need ways to promote good anachronism and resist its bad twin. Should we celebrate polytemporal lures? Pay court to diachronic parallels? Resist, like Spenserian knights, the twin temptresses of past and present? The dilemma is particularly acute for premodern ecocritics, since our subfield can’t help but keep a Cyclopean single eye fixed on ecological catastrophe. Those of us like me who seek to pluralize the Anthropocene want to disperse environmental thinking beyond the post-industrial or post-1945 timeframes, but the hot oceans and parched deserts of the twenty-first century remain in view. We can’t help but be anachronistic – that’s Derrida’s unarguable point – so perhaps it’s best for us to come out and admit it? Like Johnston and Mueller, I’m not quite ready to propose a solution for anachronism-policing, though also like them, I suspect a touch more empathy will benefit all book reviewers. The Gordian time-knot of past and present resists unpicking, and the Alexandrine solution seems reckless. But perhaps a few principles are in order? Here are my ideas for productive anachronizing. It’s always the right time. The past is fluid, vast, and significantly unknown, but its pressure strikes us (in Borges’s phrase) “precisely now.” The urgent now of lived experience undergirds historical scholarship; the human sensation of living now anchors and motivates all our thinking, as it motivated the thinking of those who preceded us. The tension between anachronism’s multiplicity and now’s precision helps remind us that, in the good anachronism, nothing stays still. Now moves and shifts, as different temporalities adjust themselves in dialogue with each other and with changing audiences. Anachronizing now commits a writer to discourses of change and worlds that do not remain the same. The constant and inconstant principle of change enables us to resist the imaginary stasis of past glory. Good anachronism doesn’t refuse historicism’s rigour but instead rebuts the fantastical and destructive dream of timeless ideals. The problem to be defeated is less the brute force of historical distance than the illusion that certain ideologies are “always” valid. Nostalgia can be pernicious. It’s the bad anachronism of falsifying nostalgia that encourages white men to believe their right to political dominance is sancrosanct. That same nostalgia insists that certain canonical figures – say Shakespeare or Virgil – represent a comforting “timeless human nature” about which nothing can or should change. A richly anachronized historicism combats timelessness with variety. Canonical literature unveils plurality, not unity. The reason to engage the past is to build a better future. Against the “again” in the backward-looking fantasy of “Mak[ing] America great again,” anachronism opens an untrod path toward utopia. That hopeful social ideal is itself a half-millennium old, with the 500th anniversary of the publication of More’s Utopia coming in December 2016. Via a famously bifurcated etymology, utopia is itself variable, meaning both “no place” and a “beautiful place.” Good anachronism creates plurality; bad anachronism locks in sameness. The road to utopia turns often.